After working out in the morning (just kidding!) ... let's skip to the good part! Breakfast! We woke up our third day and we had to move hotels - we had a quick breakfast at Dean & Deluca, and then left our bags and made our way to the super famous Akihabara, a district in Central Tokyo famous for its many electronics shops. 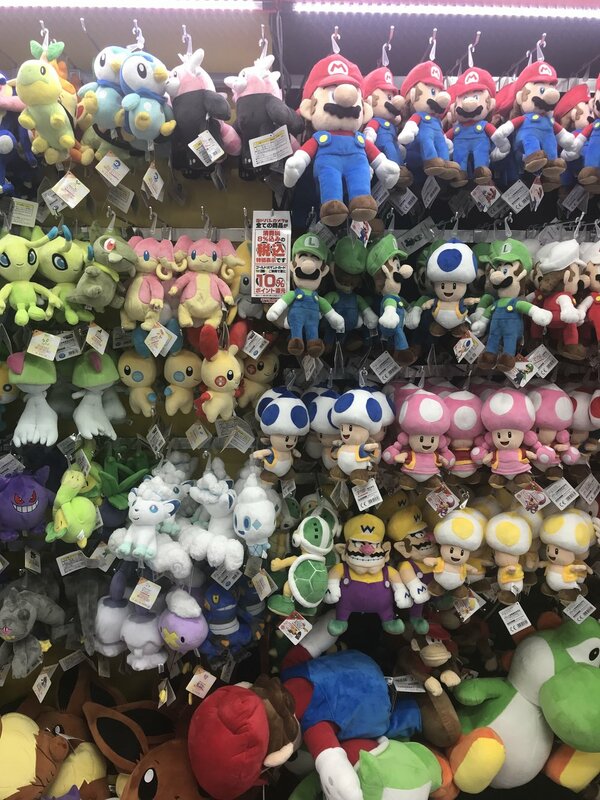 Yodobashi store, in Akihabara, is definitely worth visiting - the store has nine floors and all that you can imagine as far as eletronics are concerned. I didn't buy anything, I was more curious to see! I worked with home appliances for a long time so when I saw the point-of-sale mess I was already thinking - wow, somebody needs to organize this POS, improve the quality of the POS materials...anyways! Yodobashi is definitely a must-go if you are into eletronics (and home appliances!). Soon after, we headed to Omotesandō - the Champs-Élysées / Fifth Avenue / Oscar Freire from Tokyo. It features many flagship stores within a short distance from each other. In the photos below you can see a bit from the architecture - I loved Dior, Hugo Boss (first picture on the left) and Dominique Ansel Bakery (that is not on the main street, but close by). It is worth visiting the mall as well - Omotesando Hills. The architecture of the building is super cool - go to the top floor to look from above and then make your way down to the first floor. Following our visit to Omotesando, we headed to lunch at Ginza Maru, highly recommended by Go Journy. As I mentioned in the first part of the itinerary, Go Journy is a travel concierge service. In the end of the post you can find a discount code to have one free day of travel planning by them. Ginza Maru has a kaiseki meal at night, but it is pricey, so for lunch they have a fixed-price menu, that is delicious! We had grilled fish, rice, soup and some green tea. The lunch was moreless ~$17 per person. After lunch we went to Harajuku, which is described by Japan-guide.com as "the center of Japan's most extreme teenage cultures and fashion styles". You can walk through the main street - Takeshita Dori - and also just walk through the side streets. I loved it! Definitely worth a stop - I wish I had gone on the weekend to see it more crowded. Following that, we bought a ticket (~$68 per person, if you buy online, at Voyagin) to watch the Robot Show, which was recommended by Go Journy as well. The Robot show is really hard to explain...it was worth going, because it is very different from anything I have ever seen. If you can't make it, though, don't feel bad. For my Brazilian friends reading this, I would describe this show as their attempt to recreate carnival, with Japanese songs, lots of dancing and lots of flashing lights. To wrap up the night we went to Golden Gai. Golden Gai is a famous alley with more than 200 tiny bars, that sometimes have 3 seats...and sometimes charge cover charges that can go up to ~$20 per person. Since we just wanted to experience a local bar in Golden Gai, we went to one that was free for foreigners. It is definitely worth checking out this area or the other famous alley called Drunkard's Alley. There is a good alleyway guide at TimeOut Tokyo here. And I can't forget to say that after returning to the Park Hyatt Hotel, we went straight up to the famous New York bar to have (another) drink before heading to bed. Day four was our last day in Tokyo before flying to South Korea. My Korean friend actually had just moved to Tokyo, to the cutest neighborhood, not that far from the Park Hyatt and super close to this incredible park called Yoyogi. We decided to walk to Yoyogi to explore the area. Breakfast spots don't open that early in Tokyo, and according to the concierge, they don't usually eat breakfast outside of home, so that's why you will only find coffee shops opening after 8, 9 and sometimes 10AM. We were hoping that Yoyogi would have something open and to our surprise we found a bakery, called Pour-Kur, inside Yoyogi Village. Check photos below! Pour-Kur bakes their own bread and all the delicious pies. Their most famous bagel is the banana bagel - Charlie tried and he really liked it. I had the cottage cheese and yuzu bagel, and the combination of flavors was so different and so yummy. Pour-Kur is definitely one of those hidden-gems that is worth checking out! Not much was open in Yoyogi Village at that time - we grabbed an ice-latte from a cute coffee shop and walked to Yoyogi Park. Yoyogi Park attracts a lot of people because it is truly an oasis in the middle of the city. The apartments are very small in Tokyo, for what I heard, and people enjoy spending time outside and meeting friends. If you don't have much time to walk through the park, go towards Meiji Shrine. It is so pretty! Look at the trees (photo below). To wrap up our day, we headed to the Spa! The spa was also recommended by Go Journy. The Spa name is Therma-yu, in Shinjuku, super close to the hotel. The spa has 6 floors, is divided in men and women zones and has great massage treatments. It also has different hot spring baths and open air baths, with onsen water from Izu. The scrub treatments seem to be super popular, but I ended up choosing a relaxing massage and a feet treatment. At Therma-yu you pay an entrance fee of ¥2,850 (prices vary depending on day/period of the day) plus the massage cost, if you add any. The entrance fee includes the different hot spring baths, definitely worth the price! Our last day in Tokyo was great. Sometimes it is good to stop for a moment, during your trips, and just enjoy! We always plan so much, and walk so much...so in this last day we stopped for a few hours to relax. Go Journy discount code: Click on this link for my discount code for a free day of planning. Travel plan per day starts at $25/day.